Management Team - Procurement Solutions, Inc.
Procurement Solutions, Inc. started over 13 years ago assisting companies in adding GSA Schedules to their business portfolios. At that time the GSA Schedule services program was fairly new to most businesses and constantly evolving. 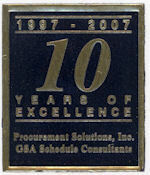 In March of 1997, after a year of assisting a small upstart company PSI became a full time enterprise as a GSA Schedule services provider. Over the years as the GSA Schedule programs have continued to change, PSI has grown in order to better assist our clients to increase their share of the Federal contract programs. Procurement Solutions, Inc. has trusted consultants and subcontractors that are sometimes brought in to partner with us in order to assist our clients. These partners specialize in Small Business, 8a/Disadvantaged Business issues, corporate training, proposal writing, pricing and financial support services and other marketing advisory services.